Jennifer Casolo received her Ph.D. in geography from the University of California-Berkeley. Her dissertation is titled “Unthinkable Rebellion and the Praxis of the Possible: Campesina Chorti’ Struggles in Guatemala’s Eastern Highlands.” She is continuing her scholar-activism in coordination with universities and social movements in Guatemala and Honduras. Kirk Butterfield has joined Investcomm Commercial Group in Kennebunk, Maine, as a sales agent specializing in commercial and income real estate. He had been president of ImpaKt Sports, a sport-specific training and sports management company in York, Maine. Samuel Gesten was named general counsel, corporate compliance officer and secretary at STAAR Surgical, a leading developer, manufacturer and marketer of implantable refractive lenses for the eye. He had been with Allergan, where he served as executive vice president, general counsel and assistant secretary. Prior to that, he spent 11 years at Thermo Fisher Scientific in a variety of positions, including general counsel. REACHING THE HIGHEST BAR. Sixteen Brandeis alumni were admitted to the bar of the U.S. Supreme Court in a June ceremony, marking the first time a group of undergraduate alumni affiliated with a college or university, rather than a law school, were sworn in together at the nation’s highest court. President Fred Lawrence, a member of the Supreme Court bar, moved the admission of the group. 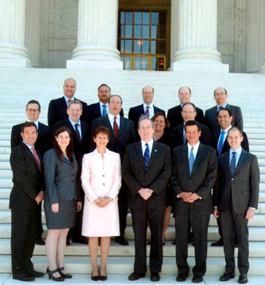 The newly sworn-in gathered on the steps of the Supreme Court Building after the ceremony. Front row (from left): Mark Fischer ’83, Debbie Berman ’87, Susan Cohen ’80, President Fred Lawrence, Philip Goldstein ’84 and Steve Rabinowitz ’83. Middle row: Brian Paszamant ’93, David Kerman ’79, Michael Zinder ’75, Janis Schiff ’80, David Bunis ’83 and Gary Wingens ’85, P’14. Back row: Eric Stern ’78, Ralph Martin ’74, Doug Rosner ’88, Dennis Kelleher ’84 and Richard Schwartz ’83.